Since 2009 over a hundred Small Island Developing States, Least Developed Countries and many others have been calling for limiting global temperature rise to below 1.5°C above pre-industrial levels. Placing the 1.5°C limit alongside the legally binding goal to hold global temperatures well below 2°C above pre-industrial levels as state in the Paris Agreement was a major achievement for vulnerable countries. The Paris Agreement combines a nationally driven bottom-up approach to promote flexibility and participation with a top-down system of international rules to promote ambition. To ratify the Paris Agreement, each country was required to submit a Nationally Determined Contribution (NDCs) which would reflect both their national pledges to reduce greenhouse gas emissions as well as domestic policy in place that would actually help tackle climate change, including adaptation plans. Paris Agreement goal to limit warming to 1.5°C to avoid the worst impacts of climate change was seen as unreachable, but updated research suggests it could be met if strong action is taken. Meting the 1.5°C temperature limit of Paris Agreement obviously requires more action compared to the earlier 2°C goal. In line with that, challenges that face by the countries will be automatically increase in order to achieve the higher goal, moreover by Asia as the world’s biggest emitter. Asia will be a key player in contributing to turn the Paris Agreement goals into reality. For parallel session on second day, opportunities are given for participant (students, lecturers and researchers who paper are selected by organizing committee) to convey the results of their research relating to four topics in parallel sessions as mentioned above. After the lunch break, the meeting will be continued by second plenary session entitled “How We Could Promote Evidence-Based Policymaking by Bridging the Gap between Policymakers and Research Communities?” In this session, the role of model on the GHG mitigation target and actions will be explained and some precedents will be introduced, followed by discussion on how to promote evidence-based policymaking based on the model. Representative of local government from several Provinces and Cities will be invited to attend this session. 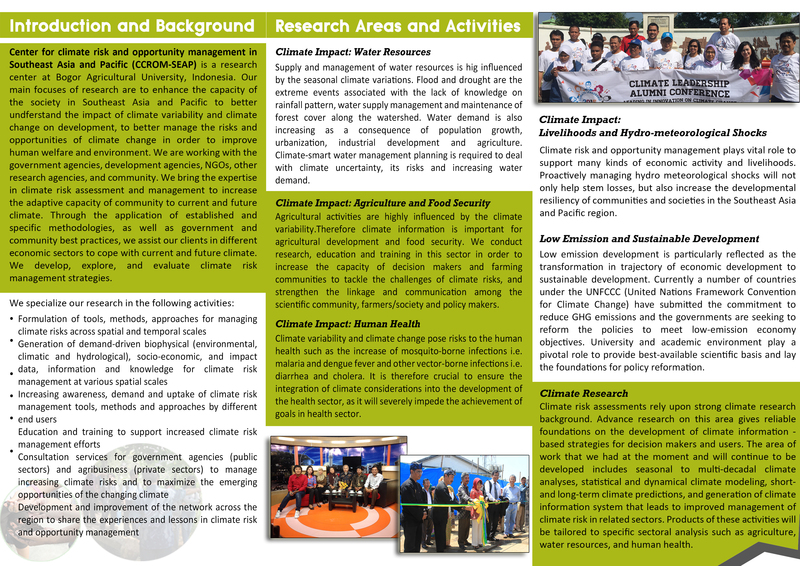 Low Carbon Asia Research Network (LoCARNet) was established in 2011 as a knowledge-sharing network of research communities and other stakeholders that facilitates the formulation and implementation of science-based policies for low carbon development in the Asian region. The aim of LoCARNet is to facilitate science-based policies in order to realize a sustainable future based on a stabilized climate. To this end, the network endeavors to establish research capacity in the region based on South-South-North cooperation, and to reflect research findings into actual policies to achieve low-carbon growth. More deatil information about LoCARNet can by found through this link: https://locarnet.org/. 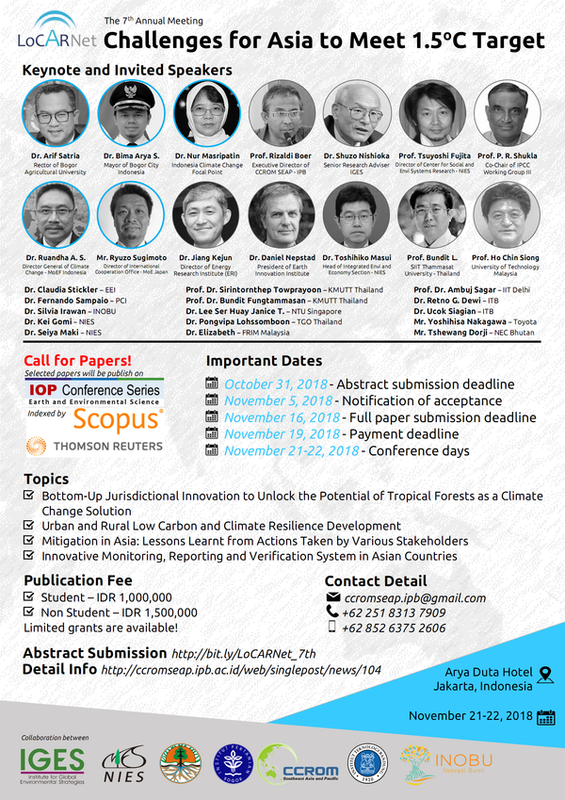 In 21-22 November 2018, LoCARNet will held The 7th annual meeting in Jakarta. 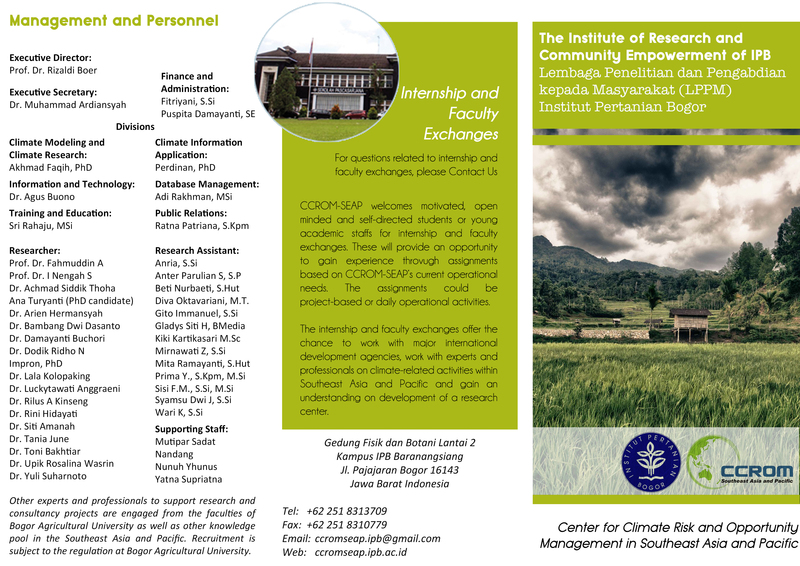 This event will be co-organized by NIES, IGES, MoEF of Indonesia, Bogor Agricultural University (IPB), CCROM SEAP - IPB, Bandung Institute of Technology (ITB) and INOBU. Limited grants are available and selected papers will be published on IOP Conference Series!